Sometimes you taste a great wine and you need to know more about it. I had a delicious Semillon -- fresh, with green fruit and plenty of character -- from the place in California I least expected that grape: Amador County. Then I had it again at a group dinner full of wine experts and I found myself overfilling my glass until ... hey, where'd that wine go? 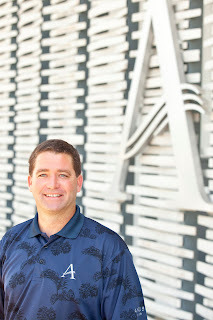 So I had to talk to Andis Wines winemaker Mark McKenna. The Sierra Foothills are known for ripe Zinfandel, and that has plenty of fans. But McKenna, the winemaker at Andis Wines, says that Amador County is so much more than people realize. What do you like best about Amador County terroir? We have the most diverse series of microclimates of anywhere in California. We have a lot of different soils. There isn't a flat plot of land in the entire area. Zinfandel is a large part of what we do, but it may not be the best thing here. That might be Barbera. Would people plant Zin there now, if they were starting from scratch? I don't think so. My take on Zinfandel is this. You can take a map of California and throw darts at it, and wherever that dart lands, you can grow Zinfandel. Foothills Zinfandel is unique, but it's just different, it's not necessarily better. "With red wine you want the grape to taste good in the vineyard. With white wine, if the grape tastes good in the vineyard, you've already missed the window of opportunity." Does Amador have cooler areas? It's a misconception that the Foothills are a particularly warm region. Shenandoah Valley has the same annual heat units as the Rutherford Bench. We have larger diurnal swings: the day may be warmer, but the nights are cooler. We're sourcing vineyards that are in excess of 3000 feet. These higher elevation vineyards are a huge advantage. You get longer hangtime. You can wait longer, you can get more flavor development. One of the misconceptions of Amador is that it's a high alcohol region. Almost half the red wines we're doing are under 14% alcohol. In addition to liking the Semillon's flavor, I liked that it was under 13% alcohol. How do you do that? Picking at reasonable sugar levels. The history that has been inherited here is looking at one aspect and not looking at the wine holistically. People wanted structure and flavor, that real fleshy style of wine. We paid a huge cost with the alcohol overwhelming everything else. We're picking at lower brix levels. It may not be the Barry Bonds of wine, but it might be a more elegant wine, that's easier to drink on a daily basis. How did you find Semillon in Amador? Bill Dillon is a third or fourth generation grapegrower. Bill owns a heavy equipment business. He was doing some of the work for us and he complained that he was going to have to spend the weekend on his backhoe, tearing out this vineyard that nobody would buy the grapes from. Until he said that, I didn't know there was any Semillon out there. It had been planted in 1978. Nobody would ever buy it. So we said, don't tear it out, we'll buy it. We thought we'd put it in the Sauvignon Blanc. Fortunately we fermented it on its own. As far as the lower alcohol, early picking thing, Darrell Corti has been a contributor to the Andis project from day one. With the Semillon, Darrell kept pushing me, "Pick earlier, pick earlier." He kept saying, "If you pick it early and maintain the acidity, not only will it taste great but it will have great aging potential." He'd be happy if we picked it at 18 brix. I wouldn't do that. A good winemaker told me with red wine you want the grape to taste good in the vineyard. With white wine, if the grape tastes good in the vineyard, you've already missed the window of opportunity. I believe in making a wine with restraint, a wine that's really easy to drink. Darrell has been good enough to dig out some 20-year-old Hunter Valley Semillon, and they're great. How did you get to Amador? When I went to UC Berkeley, I had a friend from Amador and we would go up and work at the winery on weekends. After I graduated I didn't really know what I wanted to do and thought it would be fun to move to Amador for a year while I was sending out resumes. I moved up to Amador the day after I graduated with a geography degree and I never left. This year will be my 18th harvest. How did you become the winemaker at Andis? I've been there from day one. The owners are from Hawaii, and they were looking at doing a winery project in Napa. But land is very expensive there and they didn't find the right place. Then they came to Amador one day and fell in love with it right away. At the time I was the assistant winemaker at Terra d'Oro and Montevina. They were looking for someone who knew the area. You're becoming the old man of Amador. It's just beginning to feel like that on the occasional day. Part of the joy of living a long time in one region is the relationships you have. If I could work 40 years in Amador, that would be something special. Order this wine from Andis Wines' website. Great interview and great find in the Semillon, Blake. You asked the very questions I had about Mark and his wines. Thanks for the interesting post! Ditto on the above comment. Great questions. I would like to see more of these interviews. Confidential to Bob: I agree with you that Kalin makes nice wines, but the rule here is no selling wines in the comments. As Harry Dean Stanton would say, "A man's got to have a code." Thanks this one my fav. wines great find. The Dillian's are longtime growers who are amazingly hospitable and make some solid though understated wines of their own.